The new OM-USB-2404 Series are high-speed USB data acquisition modules featuring four 24-bit simultaneous analog voltage inputs with a sampling rate of 50 kS/s per channel, and a ±10V (OM-USB-2404-10) or ±60V (OM-USB-2404-60) input range. These modules are fully compatible with both USB 1.1 and USB 2.0 ports. An anti-alias filter removes noise that may be present in the signals prior to conversion. Full 250 Vrms channel-to-channel and channel-to-ground isolation protects the module and computer from ground spikes, and ensures a reliable data stream. An on-board LED indicates the status of the device. Field connections are made to four 2-pole, detachable screw terminals. The USB 2.0 high-speed driver transfers data at rates up to 480 Mbps. Power for the OM-USB-2404 Series comes from the 5V USB supply from your computer. No external power is required. 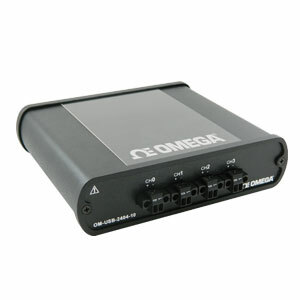 Software The OM-USB-2404 Series modules ship with an impressive array of software, including the new TracerDAQ®, a full-featured, out-of-the-box data logging, viewing, and analysis application. Driver support and detailed example programs are included for Universal Library programming libraries for Microsoft® Visual Studio® programming languages, and other languages, including DASYLab®, and ULx for NI LabVIEW® (comprehensive library of Vls and example programs compatible with 32-bit and 64-bit LabVIEW v8.5 through 2013) and InstaCal™ installation, calibration and test utility-powerful solutions for programmers and nonprogrammers alike. These modules operate under Microsoft Windows® XP (32-bit only) and VISTA/7/8 (32-bit and 64-bit) operating systems. Maximum: 50 kS/s Full performance requires connections to a USB 2.0 high-speed host controller and USB 2.0 high-speed hubs. The maximum sample rate may be lower on USB 1.1 ports. Nota: Comes complete with 2 m (6') USB cable and TracerDAQ software and user manual on CD.